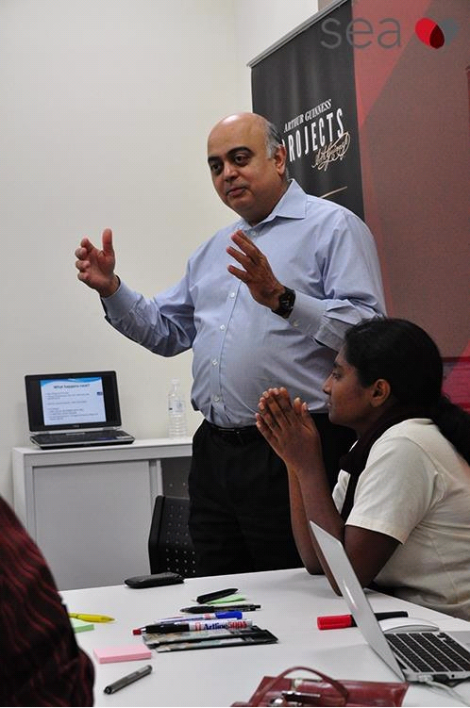 Uday Thakkar ran a 3 day workshop in Kuala Lumpur on behalf of the British Council Malaysia. The Entrepreneurs for Good competition, co-sponsored by Arthur Guinness Projects, ran a national competition to identify innovative projects that have a social or environmental impact. Twelve finalists attended the workshops facilitated by Uday Thakkar. Covering topics such as sustainability, using the social business model canvas created by Red Ochre, marketing, finance, social impact and presentation skills. The three day event ended with a public pitching practice on the 6th of April. The final pitches took place on the 11th of April. A great variety of interesting ventures from around Malaysia were represented. Projects included, environmental education, plastic reduction, student engagement into volunteering and social enterprise, raining resources for projects in developing countries, healthier food, charity transparency, a number of craft and heritage preservation projects, projects to support people with vision impairment and transport services for the public. The group were enthusiastic and passionate and were really up for making a success of their projects. Social enterprise is a topic of growing popularity In Malaysia. Warren Chan from the Social Enterprise Alliance Malaysia (who also participated in facilitating the 3 day event) commented that the call on them for support is on the increase. Uday also took the opportunity to catch up with wan Saiful who was in charge of policy for Social Enterprise London and who is now running a think thank, Institute for Democracy and Economic Affairs (IDEAS), in Malaysia.